I have very sensitive skin so when i do try products i always try samples or just use the travel size products. My main problem i have is bad break outs, dry lips and rough knees, feet and elbows. I am forever trying out new things that will work for me but i either find out they contain nuts or make me have a rash, this is why when i find a product that does work i am loyal to it , but as of lately i have been trying out different things for my dry skin. one product i have been using for my dry skin lately is Garnier body lotion intensive 7 days. I have two different kinds the first one i got is the lotion for dry/rough skin (cocoa butter amazing to help fade stretch marks), i found this one worked better on my feet then anything and the second one is the lotion for dry to extra dry skin (Shea butter), i use this one all over my body. I have a smaller size for the cocoa butter lotion but a bigger size for the Shea butter lotion, they both are pretty good at hydrating your skin and they absorb fast, you don't need to squeeze out loads because a little goes a long way. The smaller size (250ml) costs about £1.99 from superdrugs but the bigger size (400ml) cost £3, so i guess buying the bigger bottle makes more sense it's not much more then a smaller bottle. I know i have mentioned this product before on my blog but as you can tell i love it! 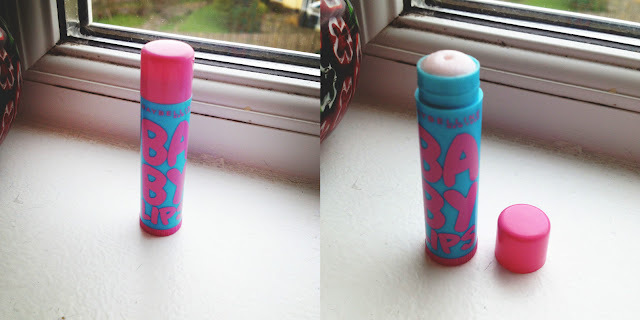 Another product on my love list is Maybelline Babylips antioxidant berry, it has a nice sweet small to it, It also has SPF 20 for sun protection which is very important to me! I would say it makes my lips feel softer and they aren't so dry anymore. It does claim to have 8 hour moisture on lips but that's not so true mine lasted about 2 hours. I got this product in my beauty box swap with Renu and it has to be one of my favourite products out of the lot. For mothers day i got my mum the No7 perfect pedicure foot soothing system, it comes with batteries and 4 different attachments each too buff and smooth your feet, i actually got a really good deal with this at boots, it normally sells for £24.99 and i got it for £12.49. I think they are still doing the deal so if you want one get one whilst they are still cheapish. I would say if you want fast results this isn't really a product for that, after about 5 times my feet were much more smoother, if your skin is very very hard this product isn't going to work for you, no matter how much pressure you put on it. I understand this has a bad rating on boots i think it got given 1 star out of 5, but the main problem is it's not a miracle worker girls, it's a nice treat for your feet. Ok lastly i have been using the Clearasil perfectawash which came with only one refill (i know some come with two) The one i have been using is the superfruit extracts & vitamin E, Now i am not going to say this happens to everyone because i don't know but personally for me within 24 hours of using this face wash my spots were less red, they were smaller and my skin was so soft. I use this product when i wake up and before i go to bed it's made me feel happier about my skin and it doesn't irritate it which is a big bonus for me. Seeing as the refills are only £2 on boots i am going to try out the soothing plant extracts & vitamin E face wash to see if it's just as good. I do reccomend you try this for yourself but i don't think you should pay full price of £12.99 either buy it from boots for £4 or fragrance direct for £4.99. On the box it says 1 refill gives you a 6 weeks supply or your money back guarantee, so let's see how true that is!